Netlotto has a lot of things going for them, but I would advise you to look before you leap. Netlotto isn’t exactly the most ideal lottery site out there. For starters, they only offer a handful of games, which are all Australian lotteries—so don’t expect popular games like Euromillions or Mega Millions here. They also accept less than 10 payment methods, so it might prove a bit tricky for some players to purchase tickets or deposit funds into their accounts. That said, Netlotto is still worth a look because they get a lot of things right. Prize claiming is a breeze; players from other countries are accepted; and the games are tax-free (for the most part). They are also a legitimate—not to mention accredited—reseller of Australian lotteries, with 15 years of experience under their belt, so you know your money is in safe hands. Want to know more about them? Continue reading below for my full take! Netlotto has a limited selection of lottery games. Currently, you can only play in 6 games, all of which are Australian lotteries. If you’re hoping to play in mega lotteries like the US Powerball, Euromillions or Mega Millions, Netlotto is definitely not the place. Sure, they do have the Australian version of Powerball, but the original, US-based one is the bigger—and more lucrative—of the two. Fridays and Sundays are the only days of the week without draws. In other words, if you join all of Netlotto’s games, you have 6 chances of winning every week. If single play games aren’t enough, Netlotto also offers group play lottery games. Netlotto accepts only a few payment methods, which somewhat limits some players from playing. Currently, Netlotto accepts 6 methods of payment, namely: Visa, MasterCard, JCB, Diners, BPAY, and bank transfers. 3 other payment methods (Poli, Skrill and PayPal) are listed as coming soon though, so you may want to keep an eye on Netlotto if you’re using any of those. Netlotto only offers 2 withdrawal methods: bank and check. Yes, Netlotto is a perfectly safe lottery site. Netlotto uses GoDaddy SSL encryption to protect player data. On top of that, they’re also an accredited reseller of Australian lottery games. Netlotto is part of the Tattsgroup and the Australian Government Reseller Agreement so you know they’re on the up-and-up. If you’re still skeptical, Netlotto has been doing this for over 15 years, so you know they’re not some fly-by-night outfit. Netlotto’s customer support options are decent at best. Take Netlotto’s FAQs: these are as basic as it gets. Do you want detailed information about topics like registration, accounts, promotions, troubleshooting, and the like? You won’t get this from Netlotto. For concerns that go beyond the scope of DIY measures, you can contact Netlotto through phone, email, or online contact form. They also provide their postal and business address. But who has the time to send Netlotto inquiries via snail mail? Netlotto’s hidden strength? Its educational support for lottery players. When it comes to lottery education, Netlotto does things a bit differently than other lottery sites. 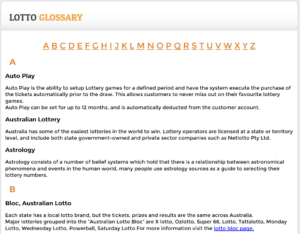 Sure, the comprehensive lotto glossary feels familiar, but it’s a different story when it comes to the individual lottery games. Most lottery sites include dollops of information about each game they offer inside their respective lottery pages, but not Netlotto. If you scroll to the bottom of Netlotto’s website, you’ll find a download link for a comprehensive PDF file on all the games they offer. 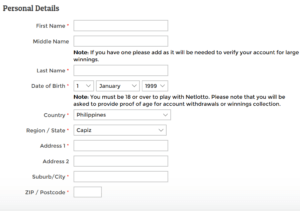 Netlotto gives you the detailed mechanics of each game plus other important rules you need to know. The PDF lets you learn about the games at your own pace, but some might find it a heavy dose of information overload. Netlotto’s lottery games PDF is basically a wall of text. But, hey, at least they went out of their way to thoroughly educate players. While Netlotto’s website is generally easy to use, I did encounter a few issues. Netlotto doesn’t deviate much from what other lottery websites are doing. 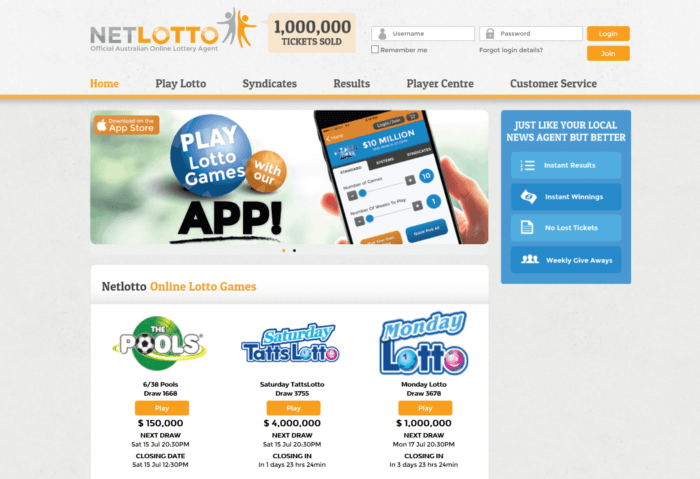 The Netlotto website’s simple design and effective layout make it easy to navigate and play. Online lottery veterans and newcomers alike should have no problems getting around. That said, Netlotto does stumble in some areas. For starters, a dedicated link to their FAQ page is nowhere to be found. Clicking on the “Customer Service” link simply takes you to their Contact Us page. You’ll need to examine the Contact Us page closely for 3 quick links which, if clicked, will lead you straight to the FAQs. In short, finding Netlotto’s FAQs is a chore. Clicking on the Quick Links is the only way to get to their FAQs. Beyond that, Netlotto doesn’t do a great job explaining their Systems and Smart Systems features. The given explanations don’t get into the nuts and bolts of these unique systems. No other lottery websites offer these features, so you can’t use another site as a reference. It would’ve been better if Netlotto taught you more about making the most of these features. Registering for a free Netlotto account shouldn’t take more than 10 minutes. Click on the orange “Join” button at the top-right corner of their website, right under the “Login” button. Fill out the registration form—provide details like email, password, name, address, and phone number/s. Confirm that you agree with Netlotto’s Terms & Conditions. Choose whether you want to receive updates via email or not. You can also decide if you want to be notified when lotto jackpots go beyond an amount of your choosing. Click on the orange “Submit Registration” once you are done. Netlotto has a few unique features, but it feels like any other lottery site as far as playing goes. Log in to your Netlotto account. Choose from any of the available lottery games. Choose the starting draw date you wish to participate in. Select how many games and succeeding draws you prefer. Click the orange “Add to Basket” button if you’re satisfied with your order. Review your order at the next page. Click the orange “Go to Checkout” button if you’re done. Netlotto also offers a few unique game features that can change the way you play. Auto Play: This is Netlotto’s version of the usual lottery website subscription, with more customization options thrown in. You can, for example, choose to use the same numbers for each draw, or have Netlotto randomly select numbers for you. If you prefer to only join draws with jackpots above a certain amount, Netlotto lets you choose the minimum jackpot from a dropdown list. Systems: You can choose from a range of numbers (usually between 7-12) and play every possible combination of those numbers as individual games. Smart Systems: You can eliminate the least likely number combinations, thanks to number matrices. Essentially, you pick at least 15 numbers and click the “Create Smart System” button. Netlotto’s system will produce the number combinations most likely to win from your selection. Unfortunately, I think this system sounds too good to be true. Netlotto doesn’t give any proof that the numbers produced by their system have a higher chance of being picked. 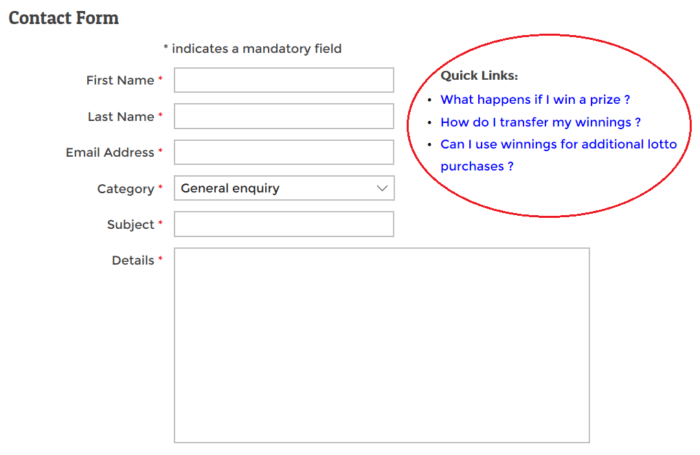 Netlotto has a straightforward prize claiming process. When you win a prize at any of Netlotto’s featured games, your winnings automatically get credited to your account. No need to claim anything in person. This applies for all winnings, whether small prizes or multi-million jackpots. Netlotto will even send you an email notification to let you know you’ve won. You get a lot more than just Australian lotteries. If you want variety, theLotter is a good place to start. At theLotter, you’ll get 53 lotteries from all over the globe. You’ll also find around 24 syndicate games and a millionaire raffle. You get more than 6 payment method options. You can use any of theLotter’s 29 accepted deposit options. These include some of the most popular credit cards and e-wallets. You have several ways to withdraw your winnings. theLotter gives you 7 different ways to withdraw your lottery winnings. You can choose which one works best for you. WinTrillions beats Netlotto when it comes to game variety. You’re looking at 20 solo games and 13 syndicates with WinTrillions, after all. WinTrillions also offers a variety of millionaire raffles and raffle syndicates. WinTrillions accepts a ton of payment methods. WinTrillions accepts 32 payment methods, and it’s one of the few lottery sites that accepts Bitcoin transfers. You can choose how you claim your winnings. For winnings $600 below, the money is deposited directly to your account. But for larger wins, WinTrillions handles those on a case-by-case basis. Most of the time, you can either let them claim your winnings on your behalf or claim the money yourself. You’re getting a lot of games. LottoKings has 19 solo play games, a few syndicates and some raffles. You decide how you claim your prize. LottoKings allows players to choose how to claim their jackpot winnings. You can do it on your own, or you can have the company claim it for you. Should you choose the latter, you can get your prize by requesting for a check or by visiting the nearest LottoKings office. LottoKings only accepts 10 payment methods. LottoKings only accepts 10 payment methods as of this writing. Still, that’s slightly more than you get at Netlotto. That depends: Are you content with only playing Australian lotteries? If you answered yes, then Netlotto should definitely be on your radar. Not only do they offer the most popular Australian lotteries, players from other countries are welcome to play here as well. Even better, Australian lotteries are known to be tax-free (though if you live elsewhere, you still might get taxed). Otherwise, Netlotto’s offerings are too limited. They don’t carry popular games like US Powerball, Euromillions, Mega Millions or SuperEnalotto. Sure, you can win millions through Netlotto’s 6 games, but those pale in comparison to the billions that some of the more popular lotteries sometimes offer. Beyond that, Netlotto’s payment methods also limit your options. If you don’t use one of their few payment methods, you’ll find it tricky to purchase tickets. Finally, there’s the Smart Systems feature. It sounds great in theory—too great to be true. It doesn’t cost extra, sure, but if you ask me, it’s still a bit misleading. As a whole, Netlotto isn’t a terrible lottery site. Yes, it’s not the best out there, but Netlotto offers a decent service despite its shortcomings. Netlotto has been an accredited Australian lottery games reseller for well over 15 years. They started out by reselling via mail, phone, and email to players all over the world—reaching over a half a million players. They transitioned to the web by launching the Netlotto website, and the rest is history. I created an account, verified it and deposited some money so I can buy some syndicate tickets. Then I was surprised that Due to Queensland legislations I can not purchase any tickets from net lotto. My advise is do not deal with them. Hey Hazem, thanks for the comment. We’re sorry to hear about your experience with Netlotto, and we’ll definitely make a note of this in our review. We hope your issue gets sorted out quickly! If you want to try other online lottery agents, our top pick theLotter offers syndicates for Australian Powerball, OzLotto, and more.